If you haven't yet heard, the new Tsu social network has the internet buzzing. Tsu dubbed the Facebook alternate, is a combination of a social media and payment platform. #Tsunation which was launched about 2 - 3 week ago and founded by tech entrepreneurs Drew Ginsburg, Sebatian Sobczak, Jonathan Lewis and Thibault Boullenger; promises to share advertising dollars with their content creators and users. The platform reward their users and content creators with perpetual royalties for sharing engaging content. Sancus Capital Prive and other investors prior to the Tsu launch, poured about $7 million into the user friendly and easy to navigate platform. Tsu is based on organic reach and unlike Facebook, is said to be 100% user owned content and reaches all your audience. Another major difference is that the platform is invite only using your Tsu short code. If your interest is peeked, here is your invite, go ahead and click here to create your own account. Though it is still too early to tell, I particularly like that the algorithm automatically tracks, measure, distribute and display the results into simple and easy to read analytics. Tsu breaks down your network into categories of followers (who automatically see your posts), children (followers who were invited using your short code), and friends (who are invited using their email or via requests). Like Facebook and Twitter the Tsu social network aggregate advertising, sponsorship and partnership dollars, which the founders says will create economics and shared with users based on the size of their network, the content shared and reshared. The Tsu monetization terms states they will keep 10% of all advertising revenue and distribute the other 90% in infinite thirds to content creators and users. Users will be able to cash out once theirr bank reaches $100, and make peer-to-peer payment transfers below $100. Some have described the platform as a ponzi scheme (which you typically pay to enter), pyramid (based on the number of people you recruit) and a MLM (based on the your sales to the public). But since pyramids are illegal and Tsu is free... these two can be ruled out. However, by FTC guidelines the platform is more inline with MLM (Multilevel Marketing). 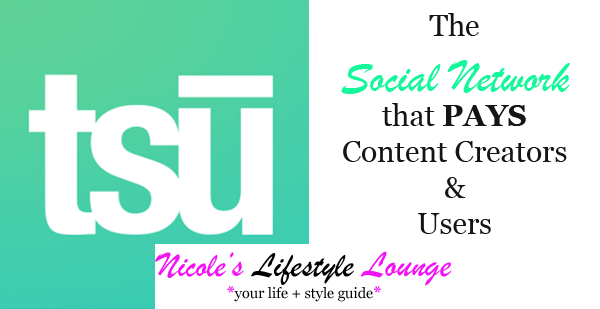 As a blogger, content creator and marketer the Tsu model does peek my interest. But I do realize that this is a huge opportunity for most to post spammy content in the hopes of generating quick cash. So to help protect your timeline or news feed from that, be careful who you accept or include as friends - as you automatically see all their content. Also from a blogger and content creator stand point I understand not to monetize other people's copy-written material, so it means more to me to create content of my own, on my own websites (making sure to brand them by adding my logo or my website url), then share to drive traffic back to my real estate which long-term is more valuable to me. So, if after reading this you are still interested in growing your tree, increase your influence and monetizing on the Tsu social network, click here. As for me, I will continue to track and see how the platform performs. Are you already a user on the Tsu social network? What are your thoughts?